Below are instructions for some of our online member resources. Use these features to promote your business and attract new traffic. Search for your ideal candidate here on the Chamber website. For details and instructions, see below. Contact Amy Alexander for questions or concerns at 972-792-2812 or amy@richardsonchamber.com. 1. Login to your account. Make sure you are the primary representative by checking for all the menu options. If you have fewer than eight options at the top of the screen (as below), you are not the primary rep for your company. If you see a full menu but are still encountering issues, you may not have primary status. To correct this issue, please contact admin@richardsonchamber.com. 2. 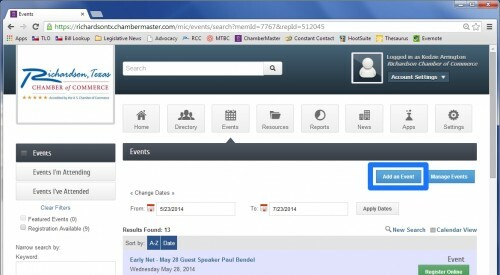 If you are the primary rep, select “Job Postings” in the left menu. 3. In the new screen (below), select the blue button “Add Job Posting” in the top right corner. 5. You may save your job posting as a draft or submit your event for approval by clicking the “Submit for Approval” button at the bottom of the page (shown below). 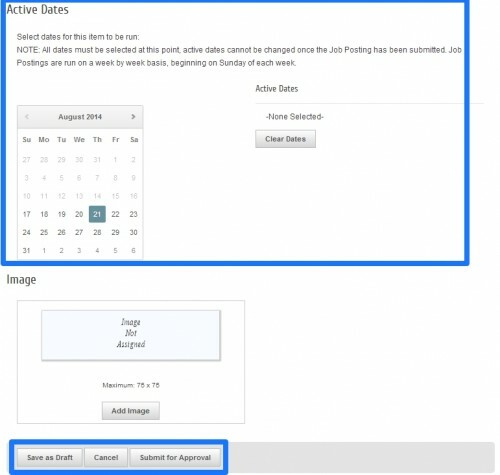 All job postings must be approved by a staff member before they will be posted. 6. A new screen will appear confirming that your submission was successful (below). 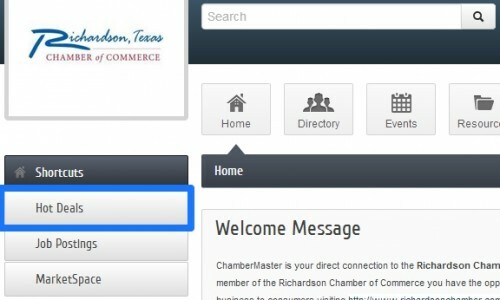 To check on the status of your submission, contact Amy Alexander at amy@richardsonchamber.com or 972-792-2812. Post hot deals to attract customers to your business on the Chamber website. For details and instructions, see below. All of the following instructions also apply to posting member-to-member deals (hot deals between Chamber members). Contact Amy Alexander for questions or concerns at 972-792-2812 or amy@richardsonchamber.com. 2. If you are the primary rep, select “Hot Deals” in the left menu. 3. In the new screen (below), select the blue button “Add Hot Deal” in the top right corner. 5. 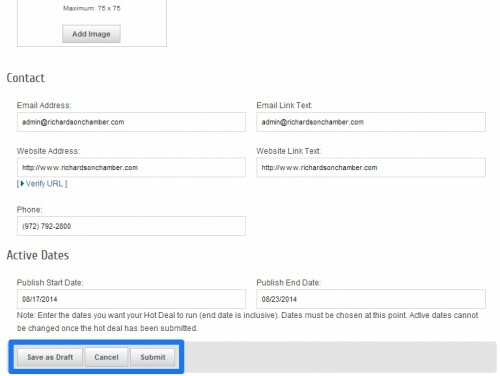 You may save your hot deal as a draft or submit your deal for approval by clicking the “Submit” button at the bottom of the page (shown below). 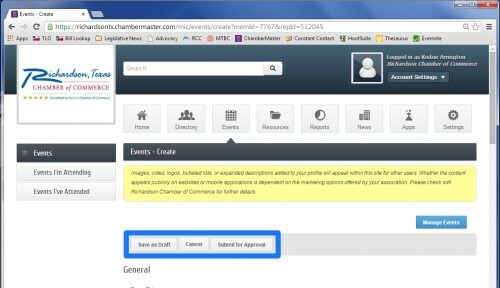 All hot deals are automatically approved and posted to the Chamber website. Changes to deals may be made by selecting "Manage Hot Deals" on the screen in step 3. 1. Login to your account. Make sure you are the primary rep by checking for all the menu options. If you have less than 8 options at the top of the screen (as below), you are not the primary representative for your company. To correct this issue, please contact admin@richardsonchamber.com. 2. If you are the primary rep, select the “Event” option from the menu. 3. In the new screen (below), click on the blue “Add an Event” button in the top left corner. 5. You may save your event as a draft or submit your event for approval by clicking the “Submit for Approval” button (below). All events must be approved by a staff member before they will be posted. 6. A new screen will appear confirming that your submission was successful. 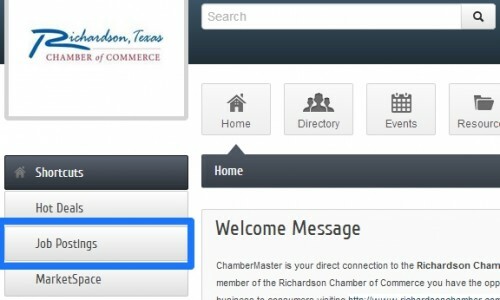 To check on the status of your submission, contact Amy Alexander at amy@richardsonchamber.com or 972-792-2812.